Being there made me realize some things though. 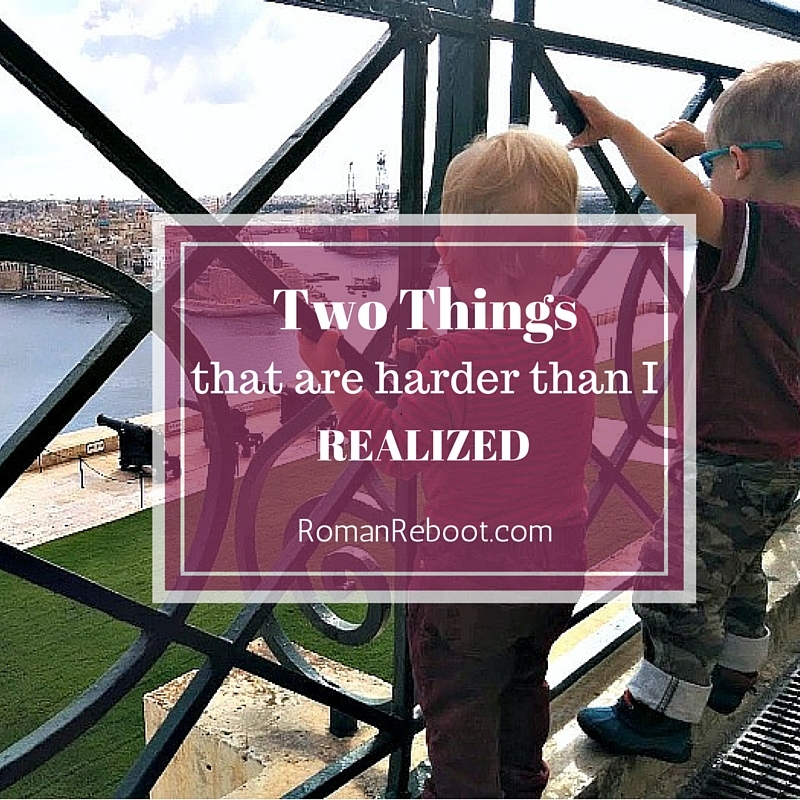 Just like it is OK to admit things can be hard, I think it is OK to acknowledge that some things are tougher than I realized. Did you know that English is one of the official languages in Malta? Maltese is a crazy language that is parts romance language, Arabic, and Klingon, but they also do English. Signs in English. Menus in English. The population speaks English. I couldn’t put my finger on it, but I did notice, even on Day 1, that things felt so easy. Ordering food didn’t make me self-conscious. I wasn’t worried about communicating with cab drivers. I could banter on the playground. Finally, I realized that it was the language. It wasn’t until the barrier was gone that I realized how tough it can be to do a foreign language all the time. I mean, yes, I do spend the majority of my time in the English-speaking community, but I also do cafes, stores, the market, restaurants, playgrounds, etc. I interact. Or at least I try to. Please PLEASE do not interpret this as an everybody-should-speak-English comment. It’s not. They shouldn’t. I live in Italy and people speak Italian, as they should. It just made me realize how I do feel a bit isolated. This can work to my advantage, like when the cranky dude on the bus is ranting about my stroller. Huh? (Smile pleasantly.) Sorry, I can’t understand. But it also makes you feel cut off. I feel like there are many missed opportunities for small interactions. Like when someone makes a joke at the supermarket checkout. Or somebody cracks about a bus delay. It all goes over my head. You might think this would make me want to redouble my language efforts. To tell the truth, however, it just makes me feel more discouraged. To get to that level of interaction would take oodles of effort. Yes, you have to start somewhere. But I feel like I could try hard all day every day and never make it close to that level. So for now I’ll just keep working on my Italian with my go-to market vendors and my frequent baristas. And I’ll cut myself some slack occasionally. Because it is hard. I’ve written about this before. Being in an easier dining atmosphere just hammered the point home. Eating out in Italy with kids is tough. In Malta, we had lots of dining options with varying levels of formality, all within a stone’s throw of where we stayed. We could do sit down casual pizza, fancy Maltese food, or takeout kebabs. Even better than the variety of cuisine, the restaurants were open at early hours. For one restaurant, we did have to wait for them to open. But they opened at 6:00 pm! I know this isn’t so far from Italy’s 7:00 or 7:30, but to the parents of a small kid, it feels like light years. I guess this sounds rant-y. I don’t mean for it to. But I think it can be helpful to acknowledge that not everything is sunshine and roses. Some things are hard. That’s OK. If we pretend that everything is easy, that just makes it harder for others who struggle. Particularly as we just passed Thanksgiving, I’ve been thinking about all that I have to be thankful for. Besides my family and my health and all that important stuff. I really do love where I live. Rome is never boring, and there is much to explore. Adventures forever! I’m also incredibly grateful for the community here. I’m grateful for people who plan unofficial Turkey trots. I’m grateful for people who watch my kids so that I can shower or shop or just not go insane. I’m thankful for people who plan wonderful adventures and dinners. For people who offer up their homes and their tables, all at a moment’s notice. For people who get me out of bed in the morning for a run and then listen to me blabber nonstop for several miles. For people who ferry me around when I’m too chicken to drive. For people who show up with a bottle of wine and a smile and a comforting hug when I need it most. All of you are awesome, and I try my best every day to deserve you. I hear you on the language thing! I’ve never spent more than a week outside of my own language, and it is exhausting. It’s a good reminder though that my ESL students must be exhausted all the time. They have to meet the same standards as the native English speakers, but they need a different kind of help getting there, which can be a fair amount of effort for me, so I’m sure it’s astronomically more for them. One thing that is almost universal with them is that their language skills are quite a lot better than their confidence in their language skills. I bet the same is true of you.